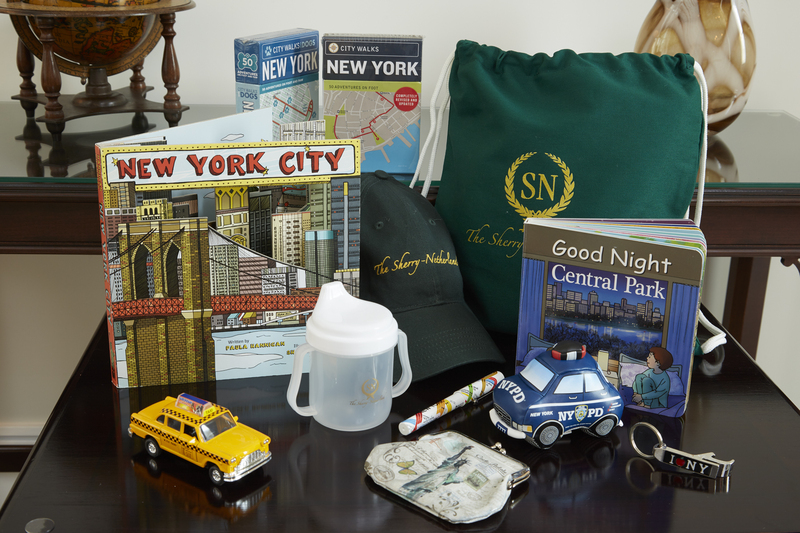 The Sherry-Netherland welcomes kids with a knapsack and New York themed amenities. Looking for a trendy Manhattan hotel with exposed brick, stainless steel furniture and live DJ music? The Sherry-Netherland on New York’s swanky 5th Avenue isn’t it — and the hotel aims to keep it that way. This iconic, Grand Dame property, which has been pampering guests since 1927, makes a point of offering the kind of Old World elegance you might find in a vintage Cary Grant movie. Old World doesn’t mean tired or uninteresting, though; in fact, this 50-room hotel offers all of the updates today’s families would want in their posh digs — including free, robust Wi-Fi and a fitness center — while also throwing in some features you don’t usually see in today’s hotel scene. The historic elevators, for example, are operated by uniformed staff, there are fireplaces in many of the rooms and some pedestal sinks even have silver-plated faucets. The lobby also boasts a magnificent, and recently restored, ceiling mural inspired by a Raphael work in the Vatican. The hotel is generous with the amenities, too, including Louis Sherry chocolates, soda and mineral water, L’Occitane products and fresh flowers. In addition, guests receive a 20% discount at the Harry Cipriani restaurant off the lobby, known for its amazing desserts. This combination of old and new, along with its prime location, are some of the reasons The Sherry-Netherland was named the #1 Top Hotel in the United States in 2016 TripAdvisor Travelers’ Choice Awards for hotels. But parents worried that the elegance of the property will be off-putting to their kids need not fear. In fact, the property is serious about fun — so much so that they offer a Family Getaway special designed for parents traveling with kids. The two-night package offers a $50 gift card to the Apple Store, located adjacent to the hotel, as well as NYC-themed souvenirs, four $10 Metro cards and a map of the transit system and Central Park, located directly across from the hotel. In addition, parents can request two roll-aways per room for free. Suite rates start at $1,199 per night. Best of all, if your group includes the family dog, never fear. The property has just partnered with BarkBox to offer a Lap of Luxury Pooch Package, good through the end of the year, geared toward pampering Fido. The package offers guests a BarkBox filled with doggie treats and toys, as well as a complimentary one-month free subscription to the service. Dog bowls and a doggie bed will also be ready in the room on arrival. Families can even arrange for dog walkers through the front desk. Rates for the Lap of Luxury Pooch Package start at $699 per night, based on a plush double room and dependent on availability. To book your luxury escape, contact 877/743-7710 or visit the Sherry Netherland website.